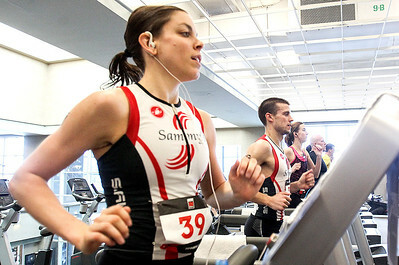 Sarah Nader- snader@shawmedia.com Jacqui Giuliano of Oakwood Hills (left) and her husband, Ryan, run for 20 minutes while participating in the Life Time Fitness Indoor Triathlon in Algonquin Sunday, March 2, 2014. In January during a marathon isn Carlsbad, CA, the Giuliano's recently broke the Guinness World record for a couple doing the fastest marathon time combined. Their combined time was 5:32, the previous record was 5:41. 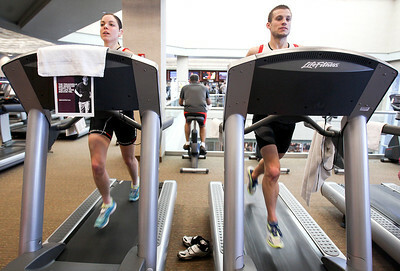 Jacqui Giuliano of Oakwood Hills (left) and her husband, Ryan, run for 20 minutes while participating in the Life Time Fitness Indoor Triathlon in Algonquin Sunday, March 2, 2014. In January during a marathon isn Carlsbad, CA, the Giuliano's recently broke the Guinness World record for a couple doing the fastest marathon time combined. Their combined time was 5:32, the previous record was 5:41.